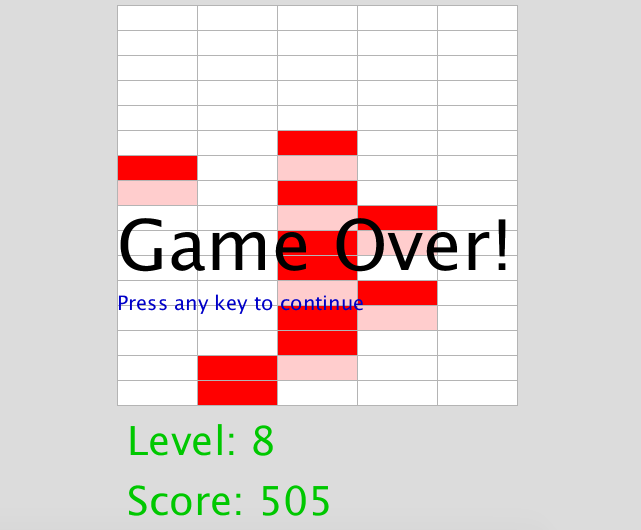 In this post I am going to share with you this simple game I created using JavaFX. Our game is a little different. We will will only stack 1 rectangle, but the rectangle can be adjacent of the below rect, not exactly on top of it. The number of rectangles to fill will be increasing according to the level and also the speed. The game was previously created in Processing, but most of the code I could reuse in the JavaFX version! You can find the source for the processing version in my github. JavaFX was always a platform for games since its 1.0 version. I remember we even had a blog specific for JavaFX script games. Since the end of JavaFX Script and with JavaFX 2, we have some samples that might be downloaded in Oracle's site. To get start with games on JavaFX I recommend this series of posts by Carl Dea. The game is basically based on update a boolean matrix and read it to create a visual representation. When the user click on the game, we make a loop in the matrix to see if the block in the previous line is true or if the block in the current line is adjacent to the block in the previous line. The two important classes in our program is the Game Engine and the game itself. The game engine is responsible to make the game alive, because it will make the game update the screen on a given frequency and make it draw itself. There are classes that does nothing. We need to create a concrete class, so we did, we created the StackerGame class. It contains the matrix that represents the game and will draw the grid and the rectangles according to the time, level and user's input. The logic of the game is basically move a boolean in the matrix and fix it when the user clicks. If the user click was done when the rectangle had a block below it or adjacent, the game will continue, if not, we will call game over and when the user click again, the game will start from beginning. Note that the score is higher when the user makes a perfect stack and lower when the user stack using an adjacent block. The game is drawn in a canvas, which is easier to control in our case(we are coming from Processing!). * Handle the end of the game event. It was a simple demonstration of a game using JavaFX. As usual, it was done for fun, in a few hours... Don't judge possible bad code... The source is in my github.